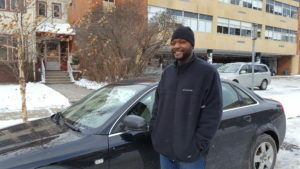 You can now donate a car to MicroGrants for our transportation grant program. Car donations can be taken to any Bobby and Steve’s Auto World location. Bobby and Steve’s will assess its value and determine if repairs are necessary. This new program will help meet the increased demand for transportation grants. Like most of us, grantees find access to transportation is key to their employment. They also need cars to take kids to school, get to classes themselves, and get to the grocery store. Without cars from MicroGrants, many of our grantees would be forced to take long, complicated bus commutes or even forfeit employment opportunities entirely. This new program will help even more grantees get the cars they need for better employment and a higher standard of living for their families. To donate a car, call 612-200-8174.